Kevin McGrath is an acclaimed photographer, recognized for his artistic talent of capturing the beauty and wonder of the natural world. Born in 1977 and raised in southeast Michigan, Kevin was introduced to the wilderness at a young age. He spent eleven years camping and hiking with the Boy Scouts, achieved the rank of Eagle, and found much enjoyment in taking pictures of their trips. In 2000, he graduated from the University of Michigan with a Bachelors of Science in Electrical Engineering. He then spent three years in the heart of tornado alley and graduated with a Masters of Science in Meteorology from the University of Oklahoma. His time in Oklahoma allowed ample opportunity to chase storms, while conducting field research with the Doppler on Wheels (DOW) mobile radar trucks and also on his own. His wide collection of severe weather images from the beautiful rolling landscapes of the prairie is as impressive as it is breathtaking. His time-lapse video capture of a rotating severe storm in central Oklahoma has been showcased in a number of severe weather documentaries, including Nature Tech: Tornadoes, produced by the History Channel. In 2003, Kevin and his wife, also a meteorologist, relocated to the beautiful and isolated island of Kwajalein, in the west central Pacific Ocean. Here, she worked as a weather forecaster and he as an IT manager at the weather station providing support for test missile launches at the US Army Reagan Missile Test Range. 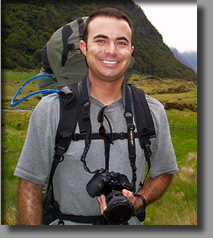 Kevin found a niche on Kwajalein, providing wedding and portrait photography and event videography services. Please take a moment to browse through his collection of work from this unique tropical location. Kevin and Valerie said "goodbye" to the island lifestyle when they moved back to the States in 2007, settling in the Huntsville, Alabama area. Kevin’s photographic style is influenced by many, but none more influential than that of the late and celebrated photographer, Galen Rowell. Galen pioneered a special brand of participatory wilderness photography in which the photographer transcends being an observer with a camera to become an active participant in the image being photographed. Additional influences include Ansel Adams, Dewitt Jones, George Lepp, Art Wolfe, and Frans Lanting.